Rooneys are delighted to offer for sale this excellently maintained 3 bedroom semi detached home located in the peaceful countryside village of Murroe. The house comprises of kitchen-dining room, living room, 3 bedrooms one of which is ensuite, bathroom & guest wc. Liscreagh is located in the centre of the village of Murroe and only a short stroll to the local shop, pub and restaurant along with a host of other amenities in the village. It is also close to the picturesque Clare Glens and Glenstal Abbey and while only being a 10 minute drive from Limerick City. Viewing is recommended. Situated in small cul de sac off main road. Size approx. 93.5 sq/m (1,006 sq/ft). Entrance Hall - 5.60 x 1.98. Tiled floor, carpeted stairs and landing, under stairs storage, guest wc. Guest WC - 1.47 x 1.37. Tiled floor, window, wc & whb. Living Room - 4.63 x 3.59. Carpeted, feature open fireplace, bay window, centre light fitting. Kitchen-Diner - 5.72 x 3.39. Fitted kitchen units, electric oven & hob, extractor, washing machine & fridge freezer included, sliding doors to rear garden. Bedroom 1 - 3.20 x 3.07. 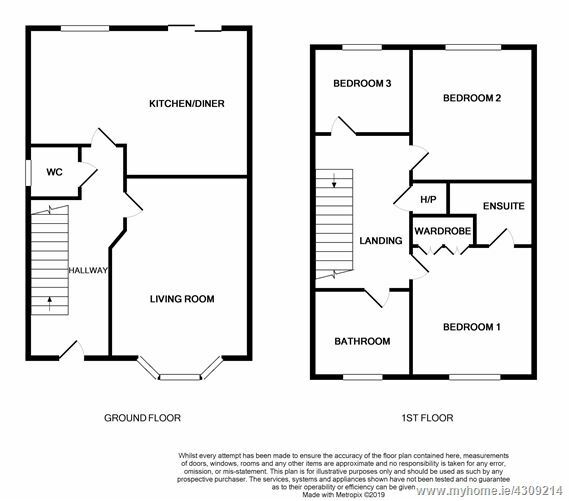 Double bedroom with ensuite, large built in wardrobes, carpeted. Ensuite - 1.47 x 1.63. Tiled floor & walls, wc whb and shower with Triton T90 electric shower. Bedroom 2 - 3.36 x 3.01. Double bedroom with built in wardrobe, carpeted. Bedroom 3 - 2.59 x 2.25. Single bedroom, carpeted. Bathroom - 1.82 x 2.36. Tiled floors and walls, wc & whb, bath with shower and shower door. From Limerick City proceed out the Dublin Road. Turn right after Annacotty onto the Murroe Road (R506). Continue straight ahead for approximately five miles. Turn left off the R506 at the signpost for Murroe. Proceed to the crossroads and follow the signposts into Murroe Village. In the village turn left at the monument and then take a left through the entrance marked Liscreagh. On entering the estate take the first right. Number 31 is on the left hand side.